On 7 December, Bombay Lodge No 3651 Raised Bro Craig Oakes. 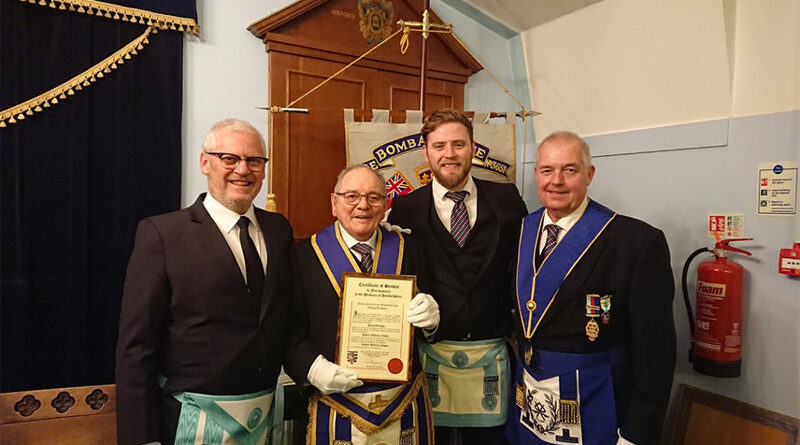 However, this was no ordinary evening – the ceremony was witnessed by Craig’s step-father, W Bro Bob Fowler, and Bob’s grandson, Bro Charlie Oakes. The evening was all the more special as Provincial Grand Almoner, W Bro Simon Cooper, was also in attendance to present W Bro Fowler with the Provincial Grand Master’s Certificate of Service; in recognition of a 47-year long Masonic career which includes two stints in the Chair and an incredible 25 years serving as Almoner of the Lodge! Bro Provincial Grand Almoner thanked W Bro Fowler for his service and the frequent assistance he provided his predecessor in helping Hertfordshire Freemasons who needed support. All in all, it must have been a great week for W Bro Fowler – it was his 90th birthday the day before and the Lodge threw a surprise birthday party the following day!